It was an unusual Sunday buzzing in Bengaluru with activities. Colours were all around. Creativity seemed to be at its peak. From perfectly cut wine bottles to make a pot, to neatly sewn fabric wastes forming into beautiful earrings and a lot more. You name it and you have it there. All this and more was at the fourth edition of "Second to none" flea market held at Jaaga on KH road. "This was the busiest of all the flea markets we have held so far," says Anupama G, the organiser of this market. "Second to none" (220) flea market is a platform where people come together to sell recycled and upcycled stuff and also some second hand products that are no longer useful to them. Clothes, luggage bags, books and a lot more was on sale at the market. More than 40 sellers came up and sold their old belongings and recycled or upcycled products. For some, the products were more out of the time spent with family. For others, it was using waste material to make something new and trendy. There were also those motivated to help the needy. "For me, it is the time my 10-year-old daughter Anokhi and I get together and do something creative. 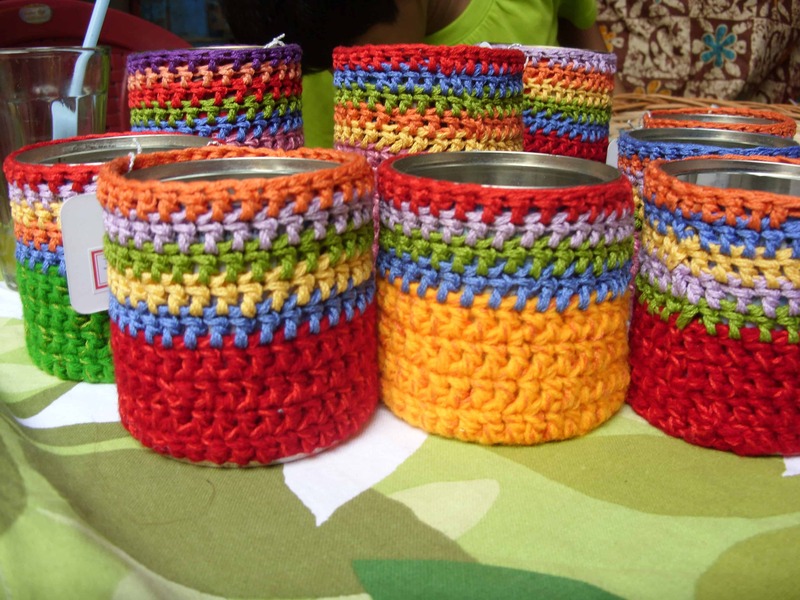 We come up with ideas to upcycle products and something innovative out of the waste. This is the time we indulge in activities and have fun," says Poornima Bhola, who sold pen stands and holders made of cassettes, button necklaces, message bottles and trendy hair bands made of jean fabric and buttons. Two friends got together and decided to do something about the waste keyboard keys and the perfume bottles. Abhishek Agarwal, 35, says they did not want to waste the keyboard buttons and perfume bottles. "We made finger rings out of keyboard keys and necklace out of the spring underneath. That was trendy and usable. And we enjoyed doing that," says Luis Svarez, 36, who sold cassette pouches, key necklaces, key cap finger rings and more at the market. They participated in the 220 market for the second time and say that the response has been better than the previous one. Recycling is not only the need of the hour, it has also become a trend these days is what they believe. Preeti Maneesh, designer says, "I was once at a tailor’s shop and saw a lot of fabric waste lying there. That’s when I thought of this idea of using these fabrics and making them into earrings. They are not only trendy but also use up the small waste materials." She sold earrings made of waste fabric and papers. A stall full of incomplete masks was an eye-catcher. Sharwari Tilloo, an artist, made these masks out of paper mache and completely organic and herbal materials like Methi, twigs and leaves. Some feature was missing from every mask. She says, "No person is complete. Nobody is perfect. These masks symbolise the imperfection in every person. Also masks are always in muted colours. So I wanted to give a Kaanjivaram touch to these masks." Anindita Chakraborty, 29, says she was shifting place and had a lot of stuff to be given away. So she decided to come to the 220 market and sell her belongings. "I am moving elsewhere to pursue higher studies. I have a lot of clothes and books to be given away. So I though of coming to the market and trying to see if I find any buyers. "This was the first time she participated and the experience has been overwhelming for her. She sold her clothes and books that she could not take along with her. Sonia D, a designer selling Bum Bags at the market says, "We have collaborated with NIMHANS where mentally challenged people make bags out of the waste, roughed pair of jeans. In this way, they are able to make some money for themselves." These bags are made out of the waist and bum portion of the jeans stitched and made into trendy handbags. She says this is the fourth time she has participated and the response is increasing with each time. The stories were never-ending. In addition, it was a sign that people’s minds were opening. Some were welcoming the concept of ‘garage sale’-culture from the West while some others felt it was too early to accept the concept completely. Still, it surely was a fun market with lot of happenings all around. Not to forget Krishna Panyam’s beautiful Origami structures on display. What is fun without food! Flavours like tomato jams were a sure hit. Freshly baked cupcakes were the major attraction. Strawberry cupcakes with chocolate frostings, and chocolate cupcakes also with the same frostings were on demand by kids. All in all, it was a fun day on a Sunday. About 700 people from all age group visited the 220 flea market on April 22, 2012 and had loads of fun. Anupama says, "The response is very high this time. When we held it for the first time, it was just about 20 sellers and 250 people who joined and participated. This is the fourth time, the numbers are more than double." People taking up shooting for fun or professionally are flocking this academy in BTM Layout. Those who came in just for fun are now hooked enough to train professionally.